It has been announced that 60s/70s tv show, Dad's Army, is going to be turned into a film due to be released in 2016. 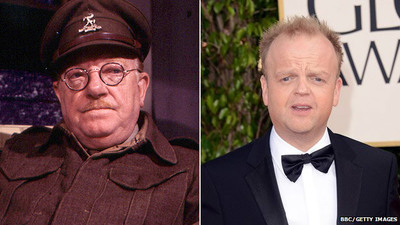 It will star Toby Jones as Captain Mainwaring, Bill Nighy as Sergeant Wilson, Michael Gambon as Private Godfrey, Sir Tom Courtenay as Private Walker, Blake Harrison as Private Pike, and Bill Paterson as Frazer. Are you happy to see the show return to the screen, or do you wish it had been left in posterity. No, I do not like repeats and in particular repeats made of a TV series. They are never as funny and I would definitely not see this one. There are so many new movies, I do not understand why they try to resurrect something old and brilliant! I've never seen Dad's Army, so I can't say I'm excited. It's a hilarious show. If you get a chance, youtube it and watch a clip. For me the original cast were Dad's Army, and I don't want them replaced with other actors. It just wouldn't be the same. I loved the TV series. Have it on DVD, Series 1 only. The cast alone in the new film, is enough to have me off to the cinema! Which is your favourite Judi Dench film?